There are many ways you can make free phone calls on the Internet, some are unlimited phone calls and some are for a few minutes. Most of the services on the Internet have free calls service to united states, Canada and some other countries but to rest of the world they aren't unlimited instead they are a few minutes depending upon which country you've made a call. Google chrome browser is the best option, once you've it then you can make a free call to almost any mobile phone providers on the globe. Either you want to call to Pakistan, India, US, Dubai, Malaysia, Ukrain, Russia or any other country, almost all countries are supported. Also Check - Download Paid Android Apps for Free ! 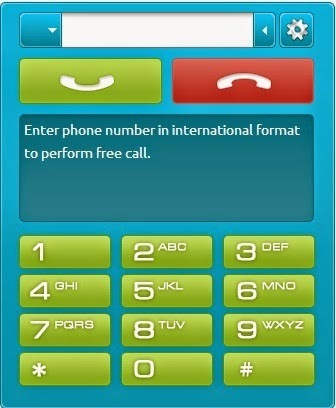 How to make 1 Minute Free Call on Internet ? To get the freebie you will need to read the post completely, also if it worked for you then it's a good thing to share with your friends on Facebook, Twitter, Google Plus or any other social networking site you're using. To all countries the free minutes aren't the same, to some they could be 3 minutes, 2 minutes, seconds, so depending upon to which mobile phone you're trying to call you'll get free minutes. So Let's get started, First of all visit the website by clicking here, if you're familiar to free calls services then you might also know about EvaPhone. Which was the same service offered. Day by day new online phone calls services are emerging, To make unlimited phones click here, it's a Gmail service, powered by Google that allow you make 2 hours daily calls to United States and Canada for free. I hope that this post will be useful for you and that you'll get benefits from it.